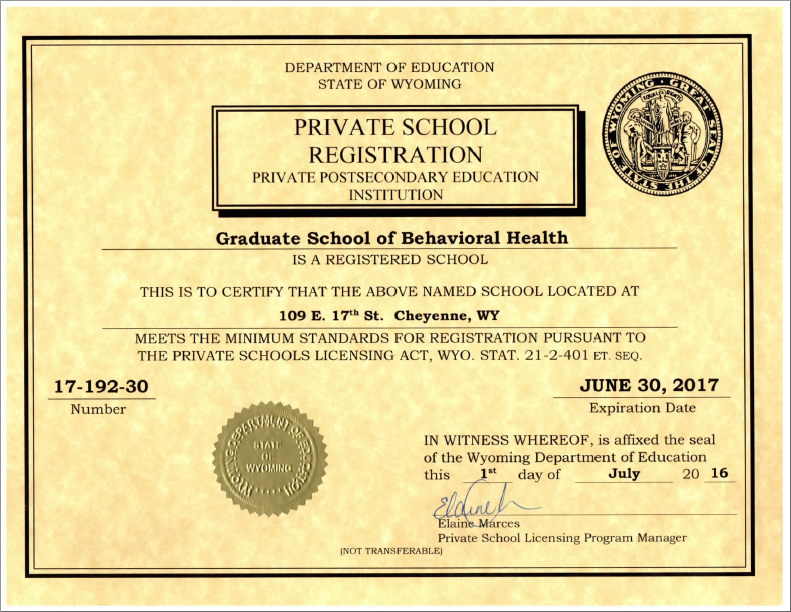 The Graduate School of Behavioral Health Sciences is registered by the Wyoming Department of Education to operate as an educational institution and to grant degrees. An entity offering higher education degree programs must be either authorized or licensed by a state to legally operate as a college, university, or graduate school and to award degrees. Registration by the Wyoming Department of Education requires that a school present evidence that it has initiated the required preliminary steps toward becoming an accredited institution and that the school be accredited within five years of the date of its initial registration. Accrediting agencies are private organizations approved by the United States Department of Education to accredit state authorized or licensed schools offering higher education degrees. The Graduate School of Behavioral Health Sciences is currently seeking accreditation with an agency recognized by the US Department of Education.